At Mark Gonsenhauser’s we offer a vast selection of carpets in all fibers, patterns, and types. Including polyester carpet, which is a popular synthetic. Polyester has been greatly improved over the years and has some advantages over other carpet fibers in some applications. Polyester carpet comes in some of the richest colors of any fiber. It is process dyed so there is virtually no fading. Unlike wool carpet that may fade if installed in an area that receives excessive direct sunlight. Polyester carpet has a nice hand (feel of the fibers) and is good for those who suffer from allergies. It is easy to clean and resists moths and mildew. It is an economical carpet fiber that tends to have a shorter life span than other carpet fibers. 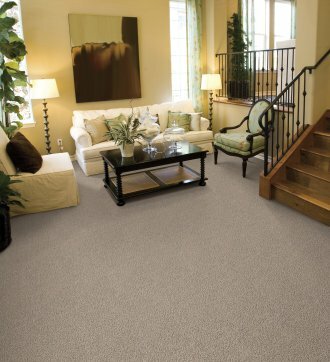 When choosing polyester carpet be sure to choose one that has high yarn density and pile that is not too long. Berber is a good choice for polyester carpet. Be sure to check out our carpet fiber chart where you can see a side by side fiber comparison. Come by our Virginia Beach carpet store and our “in house” carpet experts are here to educate you about all the various carpet fiber choices, and the various benefits and disadvantages of each one. Be sure to take a carpet color board home or order free samples!